In conjunction with 100 years of International Women’s Day, and in celebration of the artistic grace of women, Kakiseni presents “Women: 100”: a hundred hours of performing arts across Malaysia in tribute of women! As part of the Women: 100 celebration, there will also be a website, www.manifesto.my facilitation a set of commitments towards making Malaysia a better place for women. The Life Sdn. Bhd. series continues with another thought-provoking installment in February 2011. Almost everyday we read or hear about sad, gory, despicable stories of abuse relating mainly to humans but also to animals. It's time to share some of these stories - all true voiced by those who best know because they are closest to it. The 2011 installment of Life Sdn. Bhd. will be looking at abuse and the plight of the abused. In a report by Women’s Aid Organisation, a shocking 39% of Malaysian women have been abused by their partners. In another report by UNICEF Malaysia, it states that an average of seven children in Malaysia were reported to be victims of child abuse each day in 2008. Of course, there are also stories of abuse on maids and other migrant workers, employees and animals. Abuse can take so many forms and guises besides the obvious physical ones – mental and emotional abuse can be equally harming. The very first Life Sdn. Bhd. installment started back in 2004 by Dato’ Faridah Merican. The beauty of this particular series lies in its stripped down format where actors as well as non-actors share true stories, on stage, on issues that affect us living in Malaysia ranging from social, political, service, family, love and love lost. In 2007, the series took a turn to focus on specific issues. That year, those that have been affected by breast cancer took to the stage to share their stories. In 2010, it shed light on another important issue – the HIV / AIDS epidemic. It was groundbreaking to say the least – nine individuals stepped on stage for the very first time to share their stories on HIV / AIDS. Like previous Life Sdn. Bhd. shows, the forthcoming edition goes beyond storytelling. It is a vehicle to raise much-needed awareness on abuse, change people’s perceptions on the issue, move them to take action and at the same time empower the victims and help them heal. Life Sdn. Bhd. 6: Abuse will also feature a specially commissioned work by singersongwriter Ian Chow called Lullaby. It is our pleasure to able to attend the first show out of many other show arranged for MANifesto Woman:100. Thanks Nuffnang and NgaiYuen for the invite! Glad that Ngai Yuan and KakiSeni organize this in conjunction with 100 years of International Women’s Day. Went into The Actors Studio and saw some chairs being arranged on the stage. Quite artistic when combined with the spotlights. I like Ian Chow's Lullaby the most and you can purchase their CD with Life Sdn Bhd 6: Abuse featured songs inside. I guess from this picture you might know what is her story? She is definitely a strong woman. If I write the story here it would be too long or different from what they've shared. 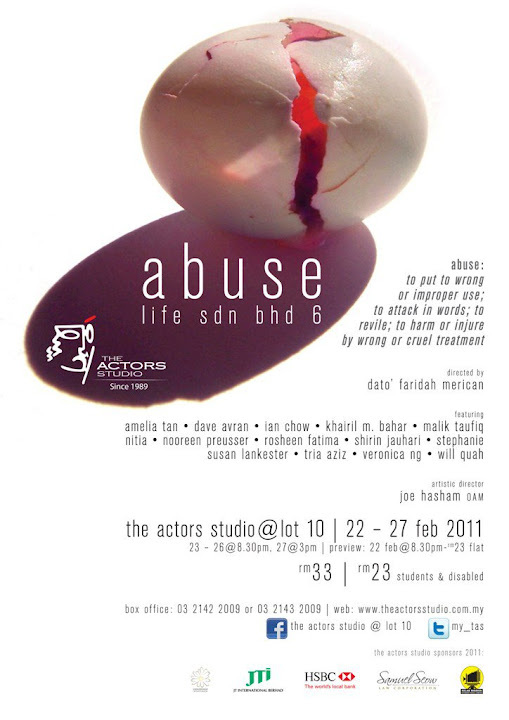 It is about abuse, many kind of abused stories which I didn't know it could happen in real life esp nowadays. She is a strong mom. Glad to see them smile back again after sharing so many stories. I know I am bad in describe in words, so I hope my photos managed to tell you some story? I am not sure if Daphne Iking was crying but she keep wiping her eyes for sure. I am glad to meet all the survivors that night, and I feel proud for you guys! Have you spotted the dog which is also one of the survivor? Abuse is not only limited to human for sure, it also involve animals too. Still dunno why people wanna record video of rabbit being crashed with high heels or smashed by glasses...It might be a pleasure for those sicked people but these cruel thing shouldn't happen. I am sure a hug is a warm and supportive move to encourage a person. Because when you appreciate something you are somehow being appreciated by others too. Buy the ticket for and watch it to know their stories. I am sure you will have lots of feeling deep inside heart. Visit kakiseni.com for more other show that will be featured in Woman:100 campaign! Be a Facebook fans too on Women:100 Faceboook Page to get latest updates about the event.